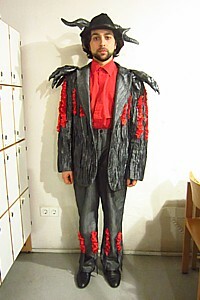 My garderobe for my jump-in as Tapioca in L'Étoile (Oper Frankfurt). Every now and then, a singer is too sick to go on-stage. 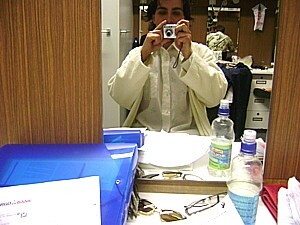 In Germany, and especially in smaller houses, having an understudy on standby is extremely rare. So, in the case of illness, the theatre will often phone up other opera houses looking for someone who can fill in at the last minute. Last Thursday, I had one such opportunity. I received a phone call from an agent, calling on behalf of Landestheater Niederbayern to jump in as Borsa in their final performance of Rigoletto in Passau. I had Friday evening off and had plans to spend a nice Valentine's day at home, but you don't receive these calls very often and the chance to do a performance in another theatre is a chance to be seen by new people. I’ve been lucky enough to fill-in several times now in very different productions, from a huge international theatre like Oper Frankfurt to the smaller production that was Rigoletto last Friday, and I think I’ve now got an idea of how to approach it so that it is not as intimidating as it was the first time. First, if you haven’t performed the role before in its entirety, you don’t do it. You’ve all heard the fairytale. As Tapioca in L'Étoile (Oper Frankfurt jump-in). A star soprano gets sick, the young soprano who nobody has ever heard of steps up for the first time, jumps in, makes a successful debut and becomes a star. I used to be amazed by these stories, but ever since I’ve seen the reality of what this entails and the people who actually do this, I know that these fairytales are missing a very important detail. I would bet in all of these stories you read about in the magazines and newspapers, the singer has already performed the role on stage somewhere else, if not in several productions. This situation is the most pressure cooker situation you can put yourself in as a singer: no runthrough, sometimes no musical rehearsal and then you have to go straight into a performance. Musically, you have to be rock solid because there will be a million other things distracting you. If you have not gone through the rehearsal period, which is usually six to eight weeks of intense work, learning the music (how it is normally conducted, what the orchestra as well as what your colleagues are doing) and the story backwards, then to say it’s a recipe for disaster is an understatement. With this in mind, theatres would never ask somebody who has never done the role to jump-in. And if you lie about it to get on stage, well, it’s your funeral. Before I'm on the train, I get everything ready so I can start preparing while I’m travelling. Look up all the people who you are working with. Write them down, or put the information in your smartphone, and bring it with you. Find out if there are any cuts or changes to the music or dialogue if possible. I have had new dialogue to learn and sometimes new parts to sing as well as cuts. Look at production photos so you can get an idea of the production. Photos can tell you a lot about the production and even the costumes give you clues as to the emotion and temperament of the character you might be playing. The earlier you can learn what you need to learn and make decisions on how you are going to play this version of your character, the better for you. The train trip could give you three to five hours of preparation time. You can then be as ready as you can before you even arrive in the theatre. 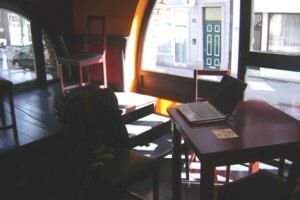 Preparing for a jump-in in Theater Aachen's cantina. Like learning a revival, you learn the role primarily from the assistant director and a DVD. So basically, once in the theatre it is the same principal as preparing for a revival (See my last blog about that here), but instead of several weeks you have several hours. Expect to improvise: it’s impossible to do it exactly the same way. Every production is different, especially in the era of concept theatre where nothing can be taken for granted in terms of the situation and character. So going in with only a few hours to learn the piece, you have to accept that there will be a lot of improvising and fast decision making. In a jump-in situation, how your character reacts on stage is probably the least important detail for the production to run smoothly. 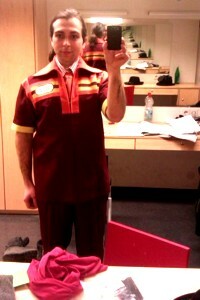 In costume for my jump-in as Borsa in Rigoletto (Landestheater Niederbayern). The most important parts apart from knowing the music and character is knowing your props, knowing where you need you to be on stage and when your interaction affects the other actors. The parts that can affect the show are the specific things that affect other people. Most of the time, where you are standing is important so that you are where people expect you to be and you are not blocking someone or are hidden in the action. For example, If you have a prop that you have to give to someone, you have to know exactly what it is and when to do it. If you have to physically interact with somebody – a fight, pushing somebody over, giving an order (say if you are a prince and somebody else is a servant), then once again you need to do it safely, properly and at the right time. So keep this in mind when you take notes – you don’t want a lot of irrelevant detail cluttering your notes up like I did in my first jump-in. You know the character and the situation, so trust yourself to fill in the gaps. A notebook and a pen that you can fit into your costume pocket is the most important tool. When you are being taken through the production take notes and put it into the notebook. Referring to stage directions on a score is pretty useless. Firstly, it’s usually already filled with notes from the last production. Secondly, there are so many pages in a score, that finding and reading your notes in between scenes takes too long. The ONLY time I would suggest to use a score is when there is choreography, since you can queue the timing of movements with the music. Otherwise, everything should be in a notebook, so that you can carry it side-stage and read your notes just before you go on. 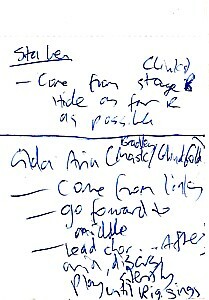 My disgusting, uncleaned notes for my jump-in as Borsa at Landestheater Niederbayern. 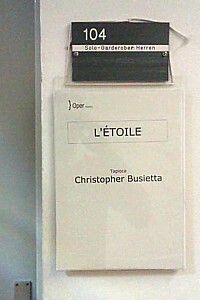 My cleaned up notes for my jump-in as Tapioca (L'Ètoile) at Oper Frankfurt. Clean up your notes after the first writing. You usually write in a hurry when you are going through the DVD (or talking with the assistant director) the first time, so if you have time, try to rewrite your notes out so that they are they are neat and concise. All stage movements should be drawn rather than written. Title of scene (in red pen if I have one) – eg. Act 1 Scene 2 “Questa o Quella”. Props required to bring on stage with you. 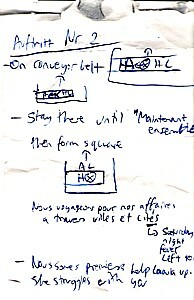 Any important actions and movements (drawn again). 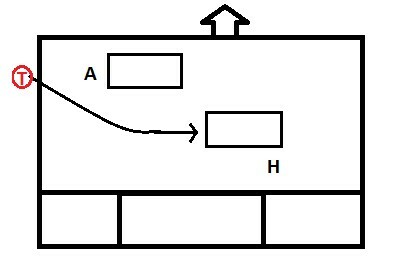 Exit queue and diagram showing where. I draw the stage as seen from my view, rather than what you would see on the production DVD you work from, so that I don’t get confused in what direction I should be going when I’m under pressure. Entrance: At playout music of aria. Top arrow points in direction of audience. Entrance arrow points in the direction Tapioca is facing. Note that everything is mirrored. Diagram (left) is drawn from my (stage) point of view. Stay by coffin until Hérrison is shot.  Walk over to Aloes and stay with her - dance on "Donnez vous là and lead her into the corner. Exit Queue: No exit. Last scene. Don't forget to give your mind a rest! Take a break at some point. Eat a meal without your notes in front of you. Warm up and then have a coffee and let yourself zone out for ten minutes. You still have to sing and act like a star! Once you are on stage, be confident. Remember in live theatre, the audience don't know what is supposed to happen so you can get away with almost anything if you do it convincingly. If you have no idea where you are supposed to be, just make it up. If the assistant screams at you from the side of stage to move right, or grab a prop or leave the stage, then do it in character as if you thought of it. 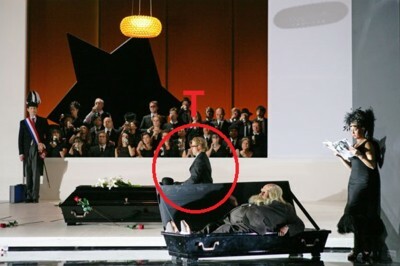 And for all you young singers reading this: Toi toi toi for the first time you have to do this!